SIDDIQA Shabazz, a 21-year-old school drop-out, became a single mother at the age of 17 and now has two children, ages three and two years old. Siddiqa’s main sources of income are braiding the hair of friends and neighbours and operating a trampoline on weekends. After the loss of her mother in 2016 who was her main source of support, Siddiqa found herself depressed and struggling to provide for her two children. It was at this point that a village leader told her about a business entrepreneurship programme being launched to target at-risk youths in her community of Sophia. Sophia is a former squatters’ settlement, which still is characterised by high levels of crime despite having been regularised over 10 years ago. For these reasons, Sophia was selected under the IDB-financed technical cooperation, “Support for the Implementation of the Citizen Security Strategy”, as a community that can benefit from the intervention. The Youth Entrepreneurship Programme, popularly called YouthBiz592 because of its focus on youths in business, was implemented through a collaboration involving Guyana’s Ministries of Public Security, Education and Business. The YouthBiz592 programme provided entrepreneurship and life skills training to 87 young people from various communities in Guyana considered to be at-risk, with the goals of providing support toward reducing negative behaviour and of generating economic opportunities to this specific group. Under this three-month-long programme, participants received coaching on starting a business and benefitted from opportunities for work attachments with established firms. Networks were developed between students and with trainers. Moral support and guidance were provided for persons who felt they did not have the skills and behaviour to contribute meaningfully to Guyanese society. Siddiqa’s journey started under the programme in April 2017. Although she faced challenges, such as being unable to work during the period of training as well as time away from her children, she was able to persevere, thanks to the financial support and childcare provided under the programme. Based on her business proposal, Siddiqa benefited from a US$1,500 grant, which she used to expand her “S&J Funzone Rental Service” business with the purchase of additional trampolines and a generator that allowed her to increase her working hours. In addition to the grant financing she received, Siddiqa said that the skills learnt on business strategies, socialising, empowerment and even parenting have been instrumental in expanding her business. She is now not only able to comfortably afford her living expenses but also is growing her business. She recently hired her first employee, who helps her with her operations. Under the YouthBiz592 programme, Siddiqa has transitioned to a life full of zest, as contrasted with previously being overwhelmed by the everyday responsibilities of providing for her family. Her self-confidence has dramatically improved. Currently, she is in the process of applying for another grant to further expand her services to a full party service and rental business. She has even decided to continue her schooling and will be taking a few subjects, inclusive of English and Mathematics, at the next Caribbean Secondary Education Certificate (CSEC) examinations. “I would recommend such a programme to anyone since it changed my life,” Siddiqa declared. At its closing, the YouthBiz592 programme was deemed quite successful, with 85 out of 87 beneficiaries completing the course programme and with an attendance averaging over 83 percent. Eighty-four business plans were submitted, out of which 72 were approved, and 66 beneficiaries received grants of up to US$ 1,500 to start their business ventures. The YouthBiz592 programme was able to institutionalise a business model on youth entrepreneurship within the Government’s Small Business Bureau (SBB). Since this was the first such programme implemented in Guyana, the success of the YouthBiz592 programme has led to its replication in 20 communities across Guyana where at-risk youths will benefit from entrepreneurship training under the Citizen Security Strengthening Programme. Derise Williams is a Senior Operations Associate at the Inter-American Development Bank’s Country Office in Georgetown, Guyana. Before joining the IDB, she was a Commerce Officer at the Ministry of Tourism, Industry and Commerce from 2004 to 2007 and also lectured at the University of Guyana in the Department of Economics. 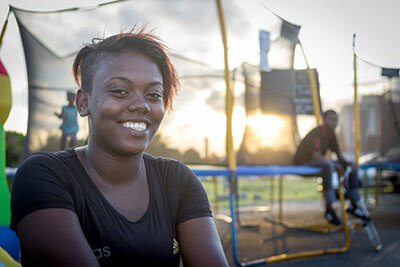 At-Risk Young Men in the Bahamas: An Endangered Species?